Rooms have common areas both inside (lounge for reading or relaxing) and outside, where you can stroll; even the youngest guests have a swing and games available. Your stay can include only an overnight stay or breakfast (Bed & Breakfast). 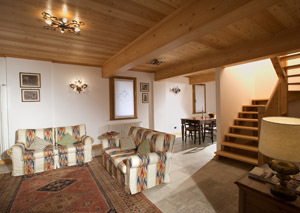 Full apartment with 2 double bedrooms with sloped ceilings, each with its own bathroom and closet. The rooms are on the first floor. On the ground floor is a large living room with table, sofas and armchairs, and a separate, stylish kitchen with a marble countertop. It has its own entrance, which leads to a porch where you can eat or simply relax in the shade during the warmer seasons. T..
A rustic loft room, very bright thanks to its windows and skylight. In the corridor leading to the bathroom is a practical wardrobe made with antique decorated doors. It features a very large bathroom with high quality fittings and shower. 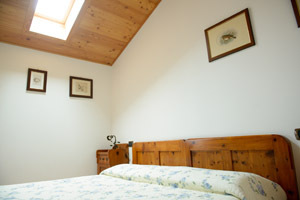 The room is air-conditioned, adjustable for both cooling in the summer and heating in winter. 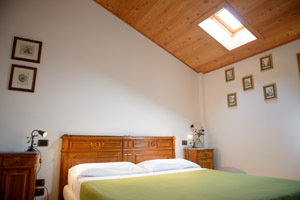 The room has a TV and a table for those who need to do..
A rustic loft room with bright windows and a skylight, with double bed and room for a cot or a third bed, available on request. In the corridor leading to the bathroom is a practical wardrobe made with antique decorated doors. It features a very large bathroom with high quality fittings and shower. The room is air-conditioned, adjustable for both cooling in the summer and heating in wint..